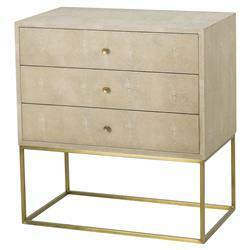 Linen-toned faux shagreen and satin brass create a nightstand that delivers effortless luxury in a minimalist package. Completely unadorned, this piece provides all the glamour a room could want. With gorgeous storage, style and versatility to spare, what more could you ask for?